Starting today, the Paris farmers’ markets are “en fête,” which means they’re celebrating with music, photo contests, and all sorts of fun goings-on. We can all join in the festivities through Sunday- a good reason to go explore some of the 83 (at least that’s what I’ve counted) food markets in the city. The city website lists all the markets by neighborhood (arrondissement), as well as the special events happening this weekend. 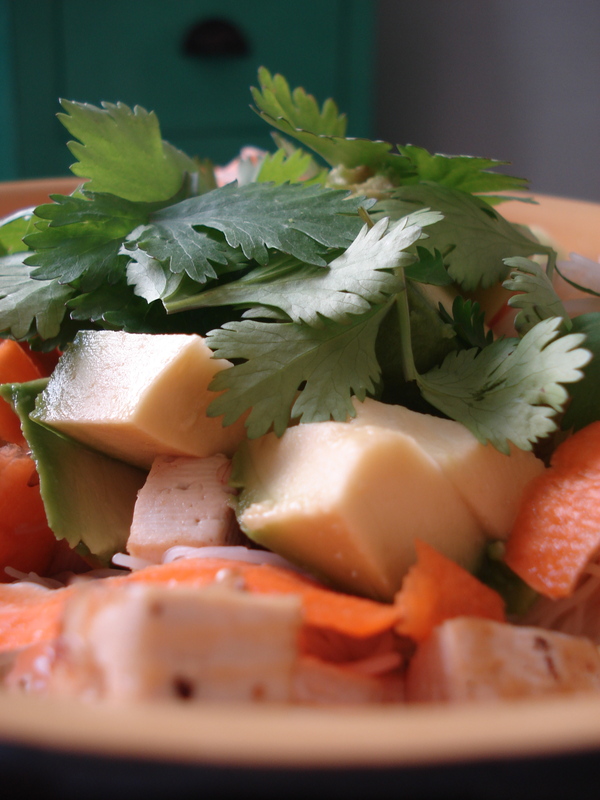 When I get back from the market, I think I’ll make my “Buddha Bowl,” a cold rice-noodle salad piled with fresh, raw vegetables. I’ve been calling this dish “Buddha Bowl” for no apparent reason, except that it sounds cute- and I always seem to feel that much more “zen” after eating one. I naively thought this pet name was my own little invention, until I just googled it (I’m chuckling since I just used “google” as a verb). Apparently, a whole slew of bloggers have a plate-less recipe with the same name and, worse… it’s an actual bowl that one can buy! Since I’m more or less addressing the subject of “enlightenment,” I’d prefer to stay in my own little world and pretend it’s just mine- my interpretation of it in any case. 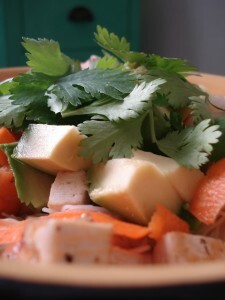 For my “Buddha Bowl,” I make a three-ingredient sauce, using orange juice and agave nectar as the secret ingredients. The orange juice gives a slight citrus taste and the nectar sweetens it just enough. For the toppings, you can obvious choose whatever you like. For me, ripe avocado and carrot ribbons are an absolute must. 1. Stir-fry the tofu (until it’s golden brown) in the sesame oil, soy sauce and red pepper flakes. 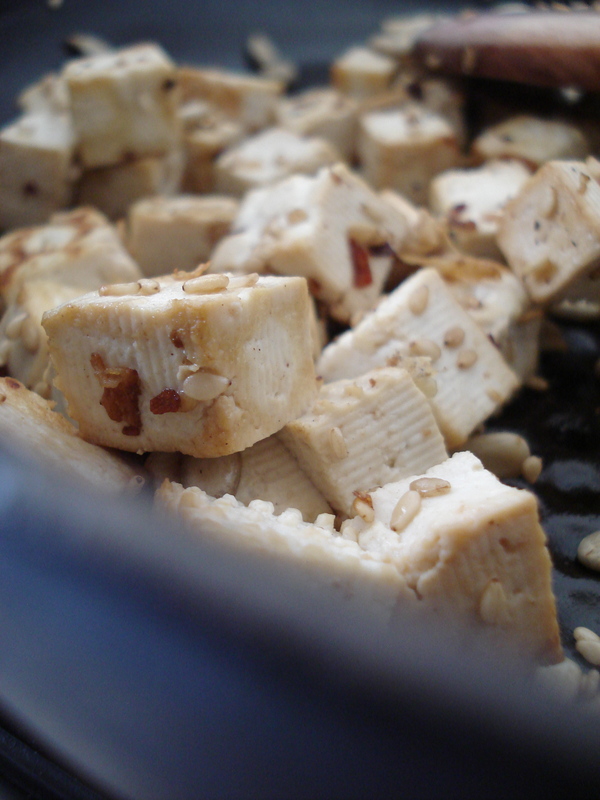 Just before the tofu is done, add the sesame and sunflower seeds so they will be slightly grilled, but not burnt. 2. Chop and prepare all the cold ingredients. 3. Cook the rice noodles and rinse in cold water* (move around under the faucet with a fork or your fingers to separate them). Shake excess water out of the colander and let sit a minute. 4. Prepare the sauce by combing the three ingredients and stirring. 5. Place noodles in bowls and cover with about half the sauce. Add the tofu, the veggies and then the remaining sauce. Decorate with the cashews and cilantro. *The package always says to soak the rice noodles in water, but I’ve never been successful doing this. I just boil them like regular pasta (but only for about a minute- you have to taste) and immediately run them under cold water. Don’t let them cook too long or they’ll get mushy. This is the perfect dish for a hot day, as the tofu can be prepared ahead of time and served cold. *If making gluten-free, make sure you use gluten-free soy sauce or another alternative such as seaweed flakes. This entry was posted in Paris Food Markets, Recipes (All), Recipes (Gluten-free), Recipes (Vegan) and tagged mains, markets, nuts, salads, sauces, spices, vegetables. Bookmark the permalink.